Happy Monday girls! I haven't done a miscellany Monday in ages and today I was feeling like writing random so there you have it. Corey and I went to dinner in the city on Friday evening. I highly recommend checking out Scarpina Bar & Grill the next time you're in Union Square. The service was impeccable, the food was delicious, and the prices were super reasonable by New York standards. I started with the calamari and feta salad. 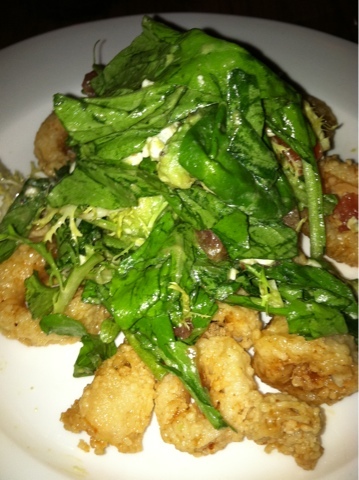 This was heavenly and combined several of my favorite things...calamari, feta, and a citrus vinaigrette. 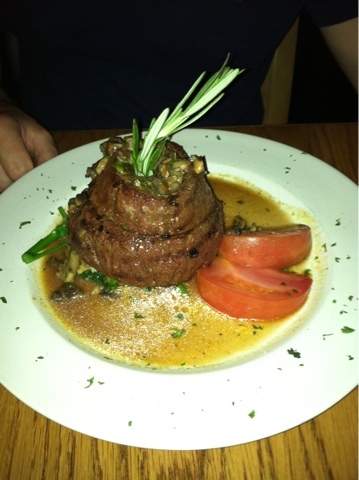 Corey had a veal dish that was mouth watering. So tender! I had lobster ravioli. 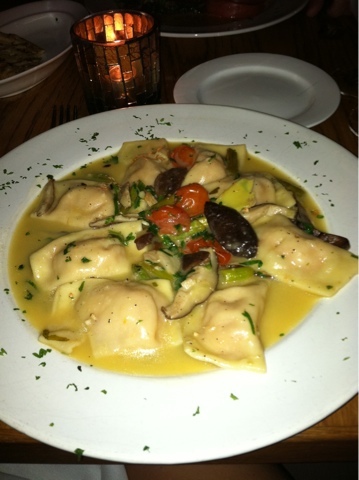 This is by far my favorite lobster ravioli ever. The sauce was so light and the flavors of the mushrooms and asparagus really complimented the ravioli. Yum! The school year has started and I am back at work. I'm a little disappointed that I can't sit on the couch with Riley and watch Life with Kelly and Michael and drink coffee out of a real mug. But, I am super excited about the school year ahead and am so happy with my new job. Corey and I met up with some friends to watch football yesterday. I guess that means that fall is really here. Football is one of my favorite things about fall. Corey and I are Giants fans (mostly Corey as I grew up with the Panthers). Corey is currently obsessed with all football games though as he's playing fantasy this year and taking it very seriously! I prefer college football and have to admit that I'm a little disappointed that we won't make it home to a Clemson game this year. I'm going to a wedding wrap-up party at Bed, Bath & Beyond tonight. I'm super excited. I spent a lot of time last week calculating the prices of the things we still needed with the discount and then seeing what I could purchase with our giftcards. We are dying for a bread machine and there are a few serving pieces of our china I want to pick up now just in case its ever discontinued. That's it today girls. What's on your mind this Monday? Your food looks delish! Especially the salad! Oh that food looks so good! 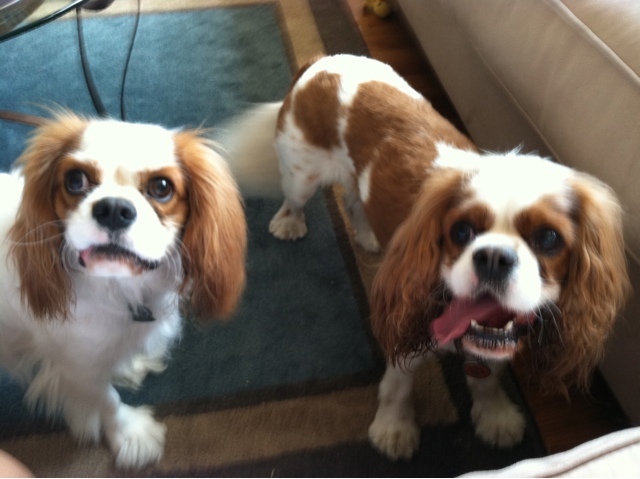 And I'm glad that Riley could have a friend over - so cute! Love King Cavaliers! So precious! Love all these things! And the doggies! I love Riley's bff :) Hope the wedding wrap up went well tonight! And I'm definitely going to have us try that restaurant in the city.